Here are some signs that you might be behind the times. I don't agree with #2. You mention that "[libraries] help isolate you from variations in the browser environments" - while this may be true I don't see how it's applicable to your example. These fancy libraries still use the same rudimentary methods behind the scenes. Hey ! 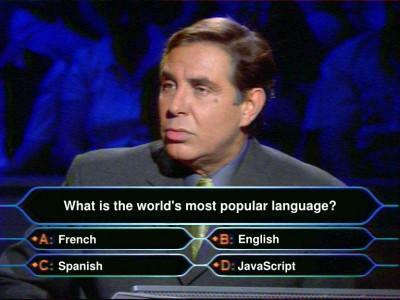 But it's our french “Who Wants To Be A Millionaire?" presenter ! Not really. getElementById may be called for doing ID lookups, but jQuery for instance lets you find elements in a much more flexible manner (using CSS style selectors) and let you operate on many at once. Also, in the case of 'element.onclick=', the fancy libraries typically use addListener which lets you have multiple event handlers for one event. I think there are other benefits to addListener over setting the event explicitly, but I don't know them off the top of my head. Mind if I borrow your "points" (with proper attribution)? @James - ... plus non-destructive event subscription can be subtlety different across browsers. @Milan - Awesome. I don't mind at all. So, now I see six signs and have a solution to just one of them. 1: This one is explained and okay. 2: This one is also partially explained since you link to the unobtrusive blog. I know YUI, Extjs and jQuery, so I could use one of them to achieve it. 3: Never used it to anything but experimental code. So why is it used what do you do to solve it? 4: I'm clear here as well, came from Java straight to YUI namespace stuff. 5: Using the libraries for this. 6: Using firebug to debug in firefox, but what would you use to debug in other browsers? The YUI logger panel? #6: IE8 has a decent script debugger, and Visual Studio isn't bad in 2008 (but could be much better). The Chrome debugger is still primitive - I'm sure someone will eventually step up with a good plug-in. In general I stick to Firebug then VS2008. I don't have much experience with YUI, unfortunately. I'm an avid reader, and I love your posts. I'm a little fuzzy on number 4. I think I know what you're referring to, but what is a better way to implement functions and variables? @Justin Thanks! I'm glad you enjoy it.